Family Drug Centre is a privately owned local company serving the Dartmouth area for generations. Always a leader in innovation and continually striving to serve the health and wellness concerns of our clients. Prescriptions of course having the focus of our purpose. Multiple, highly qualified pharmacists and pharmacy technicians always prepared to serve your every need. Free prescription delivery, a service offered for over 40 years is still promptly done. Multiple services make Family Drug Centre the place for all your prescription needs. Our Seniors Day offers a 20% discount on purchases (some exceptions apply) on our already low prices. We offer a wide range of product. Being among the largest pharmacies in Eastern Canada gives us the size and volume to afford exceptional value to our customers. WATCH FOR OUR FIRST E-FLYER COMING THIS WEEK. SIGN UP HERE ON THIS SITE AND GET EXTRA SPECIAL DEALS SENT DIRECTLY TO YOU. View our Family Drug Centre E-Flyer here. Extra special values for you delivered to your inbox. Be among the first to receive our weekly specials as well as in store specials and give aways. The E-flyer may contain deep discount specials available to only the E-flyer shopper. View our PharmaChoice Flyer here. View the latest PharmaChoice flyer here. Also is delivered in the weekly flyer bundle. Featuring the Parata Max dispensing robot to aid our knowledgeable pharmacists and pharmacy technicians, the speed and accuracy of your prescription medication is assured. Registered Sigvaris technicians on staff to fit your compression socking needs. A full range of home health care supplies kept in stock from canes to wheelchairs. Refill prescriptions easily online using our app. Inquire at pharmacy for more information. Collect Perks Points and start saving money! 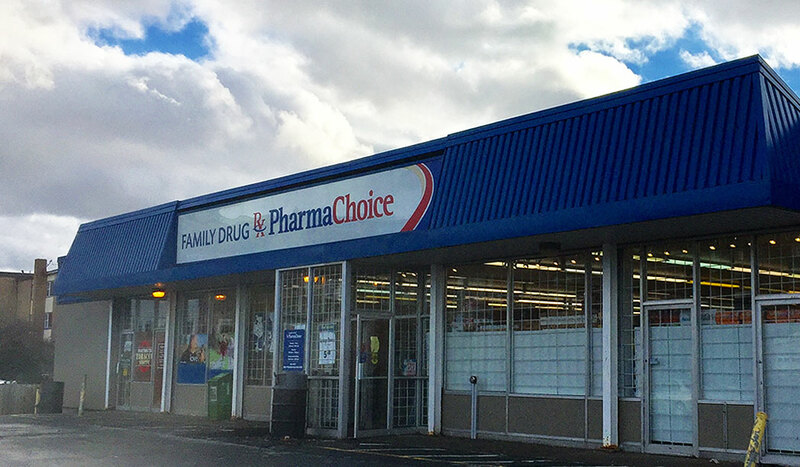 Exclusive to PharmaChoice—earn valuable Perks on purchases and prescriptions to add to your value shopping at Family Drug Centre. See in store for details. Sign up for our e-flyer and receive extra specials only available at Family Drug Centre.